When do you need the Debugger tool? what the values of certain variables are mid-execution. how things are changing, step-by-step. Load the problematic webpage in Internet Explorer 11 and open F12 developer tools by pressing the F12 key or selecting the F12 developer tools option from the Tools menu. Click the Debugger tool icon or press CTRL + 3 to open the tool. The default layout of the Debugger tool shows three panes with adjustable widths and/or heights. The Watches pane (upper right) displays variable values. When you're in break mode, it shows the local variables for your current location in code, called locals, and specific variables you've asked it to track, called watches. Callstack: This mode shows the chain of function calls that led to the current point in execution. For example, if function a() called function b(), which called function c(), and execution paused in c(), it would show the path from a() to b() to c(). Breakpoints: This mode shows a list of the breakpoints and tracepoints you've set and provides functions to delete, toggle, and edit breakpoints.. The Console icon (next to the Help icon at the top of the F12 tools) or CTRL + ` opens the Console tool in a fourth pane below the script pane. Open it when you want to view Console output, or use the Console command line. Set a breakpoint. When the execution of your code reaches it, you enter break mode and can start running code step-by-step. Initiate a break in code. Click the Break icon (two vertical parallel lines) at the top of the tool or press CTRL + SHIFT + B. The Debugger tool breaks on the next statement executed. Set the Exception control to break on unhandled exceptions and run your webpage's code until an exception is hit. 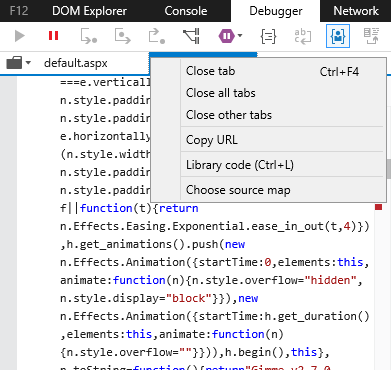 New in IE11, the Debugger tool debugs without requiring a page refresh, preserving state, and F12 tools can remain attached to the browser window. After the Debugger tool reaches a breakpoint and you're ready to move on from it, you can use the execution control icons to decide what to do next. Continue (F5 or F8): Leaves break mode and continues to the next breakpoint. New in Cumulative Security Update for Internet Explorer (KB2976627), holding down F5 will repeatedly move past breaks until you release it. Break (CTRL + SHIFT + B): Breaks on the next statement run. Step into (F11): Steps into the function being called, or if not at a function, to the next statement. Step over (F10): Steps over the function being called, or if not at a function, to the next statement. Step out (SHIFT + F11): Steps out of the current function and into the calling function. Break on new worker (CTRL + SHIFT + W): Breaks on the creation of a new web worker. By default this ignores exceptions and they're just logged to the Console tool. You can choose to break on all exceptions, or just those not being handled by try... catch exception handlers in your code. Show next statement: Puts the highlight on the next statement to be run by clicking Step into. Run to cursor (CTRL + F10): Resumes execution and breaks at the point in code where your cursor is, so long as it's a valid place to break. Set next statement (CTRL + SHIFT + F10): This lets you skip over statements in a function without having to step out of it, somewhat like commenting out the statements temporarily. You can also skip backwards to a statement that already ran. You won't rewind the webpage when you do this. You just repeat your code from that point. The two icons to the right of Exception control make large blocks of code easier to read in the script pane. Word wrap breaks long lines to fit them within the script pane so you don't have to scroll horizontally to see the full line. Source map support is new in Windows 8.1 Update. New in Cumulative Security Update for Internet Explorer (KB2976627), you can choose a source map for a file. Right click the file's tab to find this option. This is useful for code where comments have been stripped out. Mapping is not 100% perfect. Call stacks and inspector functions show the compiled/compressed variable's name as it is used in the running code, not in the original source. Also, the quality of source maps varies based on the software producing them. The quality of the mapping is affected by the quality of the map. Different types of points allow you to instruct the Debugger tool to do different things when it reaches them. Regular breakpoints are the easiest to set if you have one statement per line. In the shaded leftmost margin of the script pane, click next to a line number. A dot appears and the breakpoint is set. On lines with multiple statements, you can set breakpoints for individual statements. Right-click on a statement and set a breakpoint from the context menu or put the cursor inside the statement and click F9. Conditional breakpoints only break if a condition you set evaluates to true. For example, let's assume there's a students variable in your code and you only want to break when the value of students is greater than 20. Right-click the breakpoint or statement and click Condition from the context menu, or press ALT + F9. In the condition dialogue, enter students > 20 and submit the condition. A + symbol appears on your breakpoint and your code only breaks on it when students > 20 evaluates to true. Tracepoints are new in IE11. These act like temporary console.log() commands. To set one, right-click a statement and click Insert tracepoint from the context menu. In the dialog, enter a message in the same format you would use for an argument of the console.log() command. It has access to the same local and global variables the statement you clicked on does. Event Breakpoints and Tracepoints are new in Cumulative Security Update for Internet Explorer (KB2976627). They work like the breakpoints and tracepoints above, but instead of being triggered when a specific block of code is executed, they are triggered by specific events. Each has an optional conditional filter to help you narrow down their scope to the specific instance of an event you want to inspect. They can be added using the Add event breakpoint and Add event tracepoint icons highlighted in the image below. 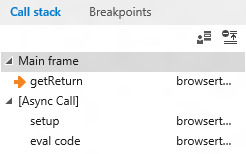 Besides appearing next to statements in the script pane, the full collection of breakpoints show in the Breakpoints pane. You can manage multiple points in the Breakpoints pane. Right-click anywhere in it to get context menu options to delete all points or toggle them on or off. The options also appear as icons in the upper-right of the pane, and to the left and right of individual breakpoints. Right-clicking any individual point presents a Condition or Trace message option in the context menu to let you change the message or make the breakpoint conditional. The panel can trace many breakpoints from many different scripts that may be feeding your pages. Clicking any breakpoint's associated file name makes that the active file in the script pane and scrolls to the appropriate line. New in Windows 8.1 Update, breakpoints are kept and no longer disappear when you close the browser. This means you no longer have to set them every time you open the browser to debug, but it also means you might want to manually delete them when you're done debugging. 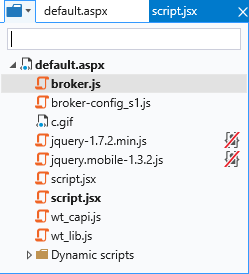 The easiest way is to open a script file and click the delete all icon in the upper-right of the Breakpoints pane. New in Cumulative Security Update for Internet Explorer (KB2976627), multiple breakpoints can be selected using CTRL + CLICK, SHIFT + CLICK, or CTRL + A methods. 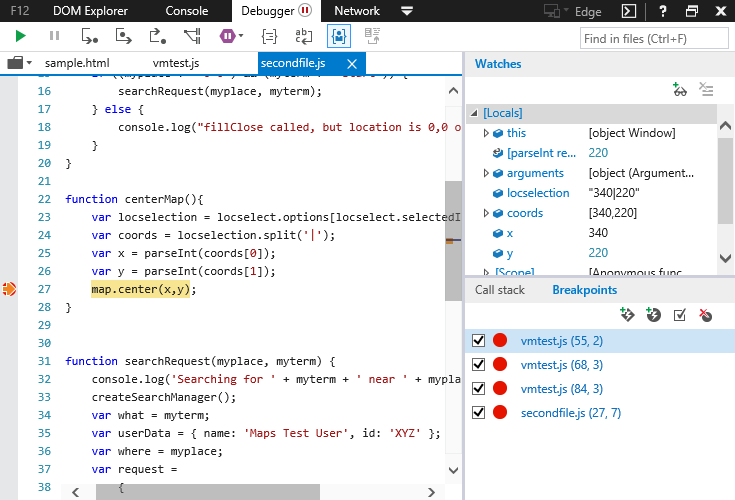 After you've set your breakpoints and stepped into your code, the Debugger tool gives you several ways to see what's going on. In the script pane, when the debugger is paused on a statement, hover your mouse over any variable, function, or object to see more info in an overlay. Move your mouse down into the overlay to expand and inspect objects much like you can if you log them to the Console with the dirxml() method. Click Add watch at the bottom of the overlay to add the variable or object to the Watches pane. The locals node in the Watches gives you a catalog of all objects and variables, both in the local and global scope, available to the statement that is the focus of the current break. This can help identify variables that are in the wrong scope. A variable or object added to the Watches pane with the Add watch command appears beneath the locals node and it is monitored at every step in break mode, even if the current breakpoint is in a different scope. New in Cumulative Security Update for Internet Explorer (KB2976627), autocomplete functions give you suggestions of known variables when adding watches. It gets even harder to trace where a function was called when it's been called asynchronously. New in Cumulative Security Update for Internet Explorer (KB2976627), the Callstack pane displays a call's asynchronous roots. The image above shows a very simple asynchronous call, created by running the following code in the console. You can open files by clicking the folder icon or pressing CTRL + O to open the file list. In the file list, documents are grouped into nodes under the primary document of the frame or window in which they're running. Hover over an individual file to show the file's full URI. Web Workers are displayed as separate nodes from the documents(s) that created them. Iframes are displayed as child nodes of the main document. The Type to filter box at the top of the file list will filter the available files by filename. To run a text search through all available files, use the Find in files (CTRL + F) box in the upper right of the F12 tools. If your text is found, it opens the first file where the search text is matched, and maps the matches in that file on the scrollbar of the script pane. Pressing F3 takes you to the next match. New in Windows 8.1 Update, a list of which files you have open while debugging a webpage is recorded when you leave the page or close the browser. When you return to the webpage, the files you had open will re-open in the debugger. Just my code is a new feature in Windows 8.1 Update which lets you indicate that certain scripts are third-party libraries that should be ignored while debugging. This prevents the Debugger tool from stepping into code you didn't write and don't plan to change. place your mouse over its name in the script pane's file list. The Just my code icon appears next to the file name. Click the icon or type CTRL + L to toggle it on or off. Right-click the script's tab at the top of the pane and select "Library code" from the context menu. Right click an item in the Call stack and select "Library code" from the context menu to mark its parent script as library code. Note Because the icon displays when you mouse over the file's name, it continues to display after being toggled off if the mouse pointer is still over the file's line in the list. To check that it's been toggled off, move the mouse over another file. The Just my code icon in the Debugger tool's icon bar acts as a toggle to include or exclude all the files that have been marked as library code. When Just my code is enabled, if library code is part of the Call stack when execution pauses, the Just my code icon in the upper right corner of the Call stack pane toggles the details of that execution frame on and off. Double-clicking on a "[Library code]" line in the Call stack pane expands its details. Keeping track of libraries between sessions is one of the features of Just my code. This is managed via JSON files located at %APPDATA%\..\LocalLow\Microsoft\F12\header\MyCode.json and %APPDATA%\..\Local\Microsoft\F12\header\MyCode.json. You can edit the files to maintain a default list or add wildcards for a domain or file type. For example, the expression *.min.js is used to mark all files ending with .min.js as library code automatically. In Private Browsing lets you browse without leaving a persisting trail in your browser history, but if you debug while using In Private Browsing, the Debugger might save some information that will persist. If you have any privacy concerns, you can remove this info by clearing any breakpoints you set, closing all files you've opened in the debugger, and you can delete your Just My Code settings by deleting the files at %APPDATA%\LocalLow\Microsoft\F12\header\MyCode.json and %APPDATA%\Local\Microsoft\F12\header\MyCode.json. Because of the additional overhead needed to run the Debugger and Profiler tools at the same time, the values in your profiling report will not reflect the actual load and running time of your code. Trying to run both of these functions at once is not supported.